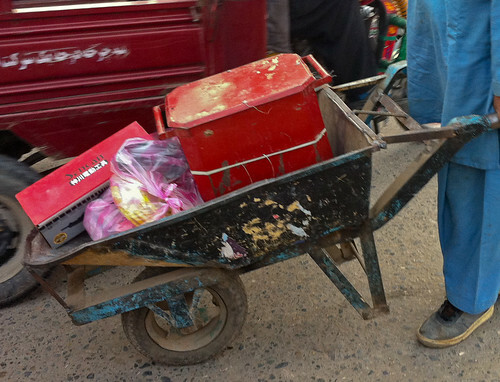 As it turns out, Jalal­abad has no Home Depot. Not even an ACE Hard­ware. So, when I wanted to pur­chase an arc welder to make fur­ni­ture and art out of old ammo cases and bul­let cas­ings, Mehrab took me and Peretz to the bazaar. More specif­i­cally, to the hard­ware store sec­tion. Jam packed stalls nes­tled next to one another, crammed and over­flow­ing with jumper cables, machine belts, rusty bolts, and cheap Chi­nese screw dri­vers. Func­tion­ing as indi­vid­ual isles of the larger bazaar, the coex­ist­ing shops all stock many tools while each spe­cial­iz­ing in a few. A cus­tomer starts a rela­tion­ship with one owner, who then sends run­ners from their staff to other shops along the way to grab any items not in stock. We choose a shop, out of acci­dent more than rea­son, and began the process of buy­ing tools. First, we col­lected assorted wrenches, ham­mers, and screw­drivers, ges­tur­ing “big­ger,” “smaller” or “heav­ier” to suit our needs. We perused the sin­gle aisle, avoid­ing the pair of chick­ens roost­ing under the fully stacked shelves. Angle grinder. Leather gloves. Weld­ing gog­gles. Check. Our shop­keeper showed us a file and told us it was “Good qual­ity. 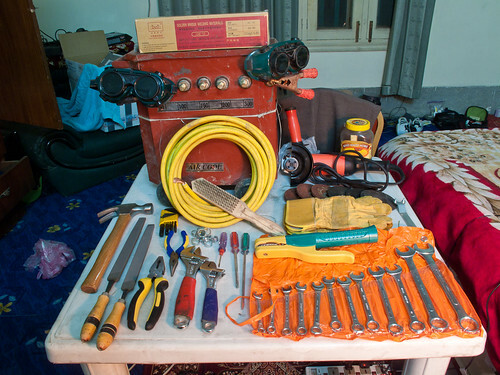 Made in India.” Even Afghans have dis­re­gard for cheap Chi­nese made tools, although the store was still full of them. The qual­ity prod­ucts they see come from India, hop­ping over Pak­istan to com­pete with infe­rior goods. Then onto the rea­son we were there: a welder. The shop sold one option, a red metal box with 5 thick screws pro­trud­ing, announc­ing the amps they would draw, and a ground­ing screw stick­ing out the side. Instead of a power cord, two bare wires extended, ready to be stuck directly into a socket, as is the local pre­ferred method of “plug­ging in” an appli­ance. How­ever, for this com­pact metal box to be use­ful as a welder we needed to piece together its attach­ments. 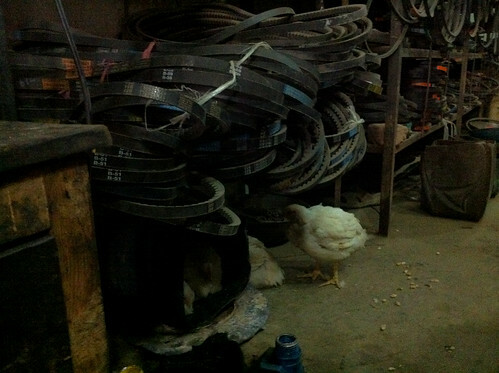 The store sold us eight meters of heavy duty wire, cut off a large yel­low spool. Next, we debated the mer­its of the two options for han­dles and set­tled on a heavy duty grip. But when I inquired about a ground­ing clamp, vitally needed to com­plete a weld­ing arc, our shop­keeper seemed per­plexed. He sent one of the boys lin­ger­ing in the shop off to find one, while he encour­aged us to drink some chai. We perched on tanks of gas and sipped steam­ing hot cups of sweet­ened, car­damom fla­vored tea until the boy returned, with a pair of jumper cable clips. Not exactly what I had in mind, but it’d do. The bits and bobs added up to most of what would be needed or use­ful for arc weld­ing and so, as we paid the shop­keeper, our tools and sup­plies were loaded into a wheel­bar­row for trans­port. Next step: assem­bly and test­ing of the Mac­Gyver welder. I look for­ward to see­ing the blos­soms of your inge­nu­ity as they grow out of the archi­tec­ture of local con­straints! Awe­some post, very curi­ous what the local tech­ni­cal infra­struc­tures are like, what needs to be done in terms of logis­tics, etc. will your work pro­duce flame? Well … did it work!? What will you be weld­ing? Also, how much was every­thing out of curiosity? y3shuA imMANu3l on No, There Is only One God!